Elizabeth Jane Callaway passed away peacefully at the age of 60 years at the Dulcina Hospice – Calgary AB with her family by her side. Elizabeth was the third of four children born to Violet “Dolly” (Kent) and Gordon Callaway of Cochrane AB. After completing school in Cochrane, Elizabeth attended SAIT to receive a secretarial arts certificate. 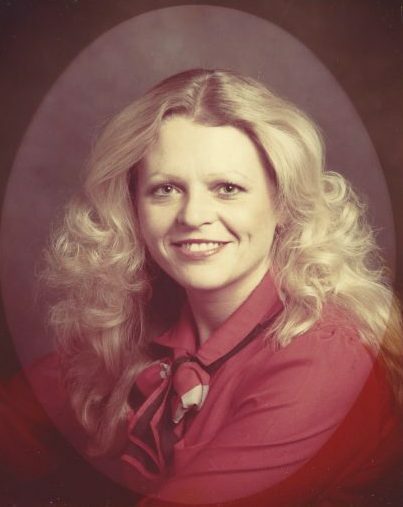 She enjoyed her years as an administrative assistant at Dome Petroleum and was actively involved in the “Desk and Derrick” club – an organization for women employed in the petroleum industry dedicated to education and professional development. After the oil industry decline, Elizabeth travelled north to share her passion for cooking in a remote oil production camp. The meals she prepared for 2 or 200 were delicious, home cooked creations. She returned to Calgary and began her short, successful real estate career. Elizabeth loved to travel to warm destinations, her favourites being Mexico, Dominican Republic and Cuba. Perhaps Elizabeth’s greatest calling was the care and comfort she provided to her mother and father in their later years. They became her life focus, and her loving care helped them to remain in their home for many years. As Elizabeth’s health failed, she never ceased to consider other people before herself. Her care of others was unending. She will be held in our hearts forever. Elizabeth is survived by her sister, Rochelle Callaway of Red Deer AB, brother David Callaway (Giesele) of Canyon BC and brother William (Lorna) Callaway of Cochrane AB. She was cherished by her nieces and nephews – Janine (Shawn), Mark, Jeffrey (Nicole), Jennifer (Darren), Daniel (Jennifer), Meaghan (Doug), Ryan, Kirsten (Matt) and Jordan (Kim) and her great nieces and great nephews – Alex, Olivia, Abigail, Raya, Bronwynn, and Sophie. Elizabeth was predeceased by her father, Gordon, and mother, Dolly. Elizabeth’s family would like to thank Cochrane Home Care, Rural Palliative Care Team and the Dulcina Hospice for the excellent and loving care they provided to both Elizabeth and her family. A Celebration of Life will be held at St. Andrew’s United Church (128 – 1 Street East, Cochrane, AB) on Saturday, March 25, 2017 at 4:00 PM. If friends so desire, memorial gifts may be made in Elizabeth’s name to the Covenant Foundation in support of Dulcina Hospice, Room 3C60, 11111 Jasper Avenue, Edmonton AB T5K 0L4. Liz was a wonderful loving person, she will be missed by so many. I will miss her. I have so many memories of growing up next to Callaway. Della and I send condolences to the family.